the cold front has either pushed the crappie back out or gave them lock jaw. only gills at my shore spot last night. they were slow too. only 8 keepers out of 12 caught. didnt try bait but it mite have helped. This weather has been crazy for sure but it looks like it may break soon. If not, maybe it will at least stop snowing! Agreed this weather isnt helping us out any! Tennessee, any luck with the roe? I know a man I call Mishawaka Joe, I meet him 4 years ago at Twinbranch, a true local, he lives at the dam, two blocks from the parking lot, 4 blocks from Zappa, fishes everyday his wife lets him. Which is everyday after work. 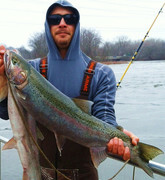 He literally has his figure on the pulse of the Steelhead and Walleye movement there. He like all true locals gave me the cold shoulder for months, I don't blame him, there's a very special fishery there, they are very,very protective ,but he got looser with the viable info over time, trust, and brew. He saw my raw excitment over fish caught! I shared with him and he shared with me..Now i catch them often... Make friends, real legitimate friends thru this site fishpeople, you will grow as a fisherman!